Bed bugs have invaded the homes of at least two dozen ravers after they sat on a pest infested love couch that was placed at an outdoor party. 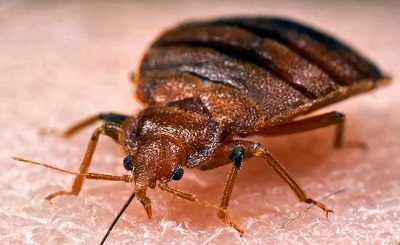 While clueless ravers were giving each other backrubs, hoardes of bed bugs were climbing on to their clothing and laying eggs. John Beaudoin, a fumigator for DéPesté, has been warning ravers for years about the risks of bed bugs. "Ravers, they're very dirty. I keep telling them that if they find couches in the garbage, to make sure that they're bug free before they use them at their parties. But they rarely listen! Instead they just throw any dirty old couch on to the dance floor without a thought or care about what might be living inside of it. I'm not at all surprised that party goers are bringing home flesh eating parasites. If anything, I'm surprised it doesn't happen more often." Rave promoter David Thuster agrees that dirty couches are a threat to raver health. "I think we have to be more careful. Promoters shouldn't use ratty old furniture at their parties without at least checking them for fleas and bed bugs. The party goers who got infested all had to throw out a lot of clothing and bed sheets, some of them even had to higher professionals to clean out their apartments. That's a huge, huge hassle." One of the bed bug victims, Gerard Custer, suspects the pest epidemic might be the product of a conspiracy. "I think the fumigators are planting bed bugs at raves in order to drum up business. The fumigation business is controlled by the mob. I mean, it's like that TV show Breaking Bad. You can't trust bug killers. They're just in it for the money." Beaudoin, for his part, was incredulous that any ravers would suspect such a thing. "People who think fumigators are all tied to the mob should lay off the drugs, and rave promoters should lay off the dirty couches."